Japan Trip Five: Kamaboko Rainbow! This is the fifth part of a multiple post series on my experience on a Japanese tv show. If you aren't up to date on what came before, start here! If you've read that already, please proceed. When we got back to the house, it was time for me to begin making the kamaboko. It's actually a very easy process, for full details see my original post. What made it particularly strange, of course, was the fact that I had a film crew there. Not only a film crew, but a Japanese film crew, who were no doubt much more familiar with Japanese food than I, and had eaten a lot more kamaboko too. The pressure was on. Everyone was very polite, asking me question about the process, how I had figured out how to make kamaboko in the first place, and how I thought this batch would come out. My mother and sister stood by in the doorway, glee shining in their eyes. The cameraman (who I have discovered was named Tetsu-San) kept having me stop so he could film close ups of the surimi (fish paste), or the bottle of sake. When I formed the kamaboko into it's traditional log shape, everyone admired my technique. Of course, later, when I was in Japan, I would learn how flawed it really was. But that's getting ahead of myself. I put the newly formed kamaboko into the bamboo steamer and set the timer for one hour. It was time to break for lunch. I had made a few things early that morning in anticipation of lunch. A basic miso soup, a pot of rice, and a batch of savory breakfast scones. Everything was very well received, which was gratifying, as you can imagine. They told me that they were very surprised that an American could make such good rice, but it's pretty hard to mess up rice if you're using an electric cooker. As for the scones, which are a recipe I made up myself, they went over really well. When Mari-San was informed that I had made them, she grinned broadly and pointed at her scone saying "like professional". I love getting compliments like that. Not long after lunch was finished, the timer buzzed. With great anticipation we gathered around the stove. The cameraman gave me the thumbs up and I took the lid off dramatically. Steam poured into the air and everyone clapped as the perfect kamaboko was revealed. Or at least, perfect for what it was, an imitation, produced by someone who had only ever eaten real kamaboko once. Akane-San translated that in Japan kamaboko logs are usually half the size. Whoops. That's embarrassing. Sihaya jumped in with the perfect comment. "It's American sized." Everyone thought that was hilarious. These aren't mine. I don't have a picture of mine. They did not look this nice. When I had spoken on the phone with Akane-San, she had suggested that I make two different types of kamaboko. In fact, she recommended I try making sasa kamaboko, a type that is made in Sendai. These kamaboko are made on skewers, shaped into bamboo leaves, and grilled over a fire. I had agreed, though I had a very hard time tracking down any information on how to make them. But, that didn't stop me. I didn't have the grill, I didn't have the right type of skewers, and I had no idea how to make them authentic. But damnit, they wanted sasakama, and I was going to make it. I had experimented a little bit the night before, and had settled on sort of frying them in a skillet. Getting the right shape was the hardest part, as my surimi was not particularly cooperative. But I managed to wrangle a semblance of sasa kamaboko. Mari-San and company, bless them, were very nice about it, although I now know first hand that they were really nothing like the real thing. Once this was done, I cut the kamaboko and they plated them, making it all look very pretty. While they filmed the kamaboko from a million different angles, we retired to the living room for a short break. It had been raining on and off all day, which was unfortunate in some ways, but had now given us a gift. Sihaya was the first to notice it, and soon we had gotten the attention of the crew. In a matter of moments we stood in the backyard, looking up at a huge rainbow. With the camera's rolling, Sihaya, my mother, and I all looked up at the rainbow, held hands and commented on how it looked like the pink band on a kamaboko. 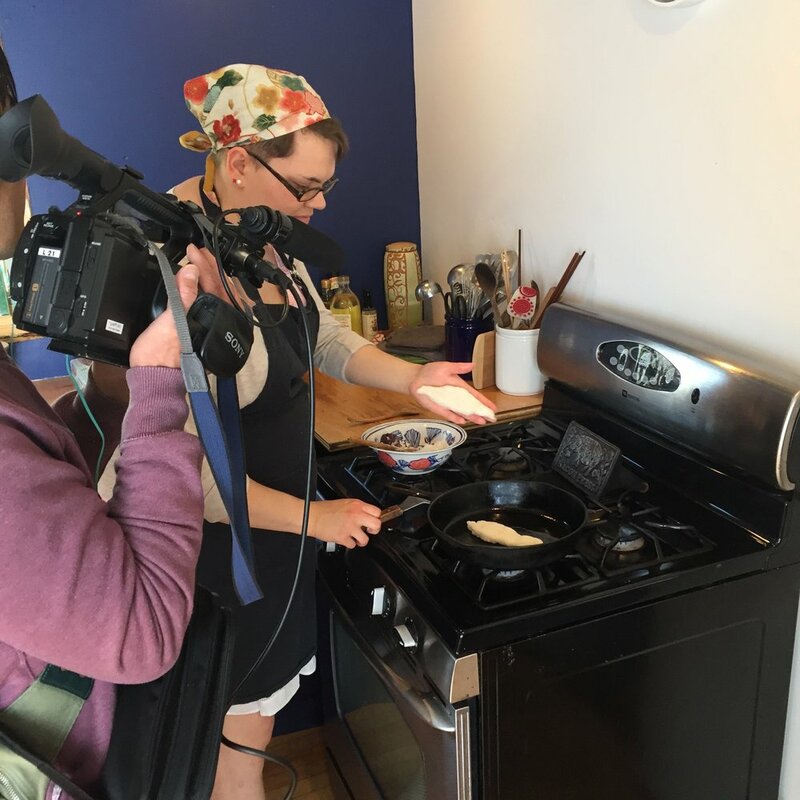 It was very sweet, exceptionally cheesy, and the film crew loved it. It was now time for the last item on the days agenda. While making the arrangements for the day, Akane-San had asked me to invite a couple friends over to do a kamaboko tasting. They wanted people who had never had kamaboko before, and even better, hadn't heard of it. Organic American reactions were the order of the day. I said that it would be no problem, but then when I thought about it, I realized that pretty much all of my friends are either vegans or specifically don't like fish. The only friend who I knew would eat fish and willingly be filmed, lives in Alaska, and would definitely not be able to make it. My only hope was Sarah, a friend from high school who I had recently reconnected with. I had sent her an SOS and luckily, she likes fish. But I still needed another person, and possibly a third, so I turned to Walter, my sister's friend, who I could easily pass off as my own. He was more than willing to help out, even though later I would find out that he had been painting his store all day, took two hours off to be filmed eating kamaboko, and then run back out the door to negotiate a lease. Needless to say, I brought him back a souvenir. As the hour of the tasting grew closer I got a text from my friend. Unfortunately, there had been a miscommunication with her ride and she was stranded a few hours away. Luckily, I had a back up. My mother had thoughtful gotten a friend of hers to be on call in case we needed a third guest. After a quick phone call, Pam was on her way. Cat's Always have to get in the middle of things. At six o'clock pm, after one of the longest, not to mention oddest, days of my life, we set the table and greeted our guests. Both of them entered the house to find a camera pointed at them, and I'm sure experienced something similar to what I had that morning. But, they rallied impressively and were naturals. Mari-San had everyone but myself sit down at the table, while I hid in the kitchen with the kamaboko. Once everything was prepared, I carried out the kamaboko, and set it in the center of the table. Neither Walter or Pam had any idea what to expect, and I'm sure that there wasn't much to tip them off as to what they would be trying. After all, nothing about the appearance of kamaboko really says "fish" to the uninitiated. It almost looks more like a fancy French dessert. One at a time, with the lens slowly zooming in on their face, first Walter and then Pam took a bite. Gosh, I'm just so grateful that they were such naturals. They "oohed", they "aahed", they were very flattering. Finally, Mari-San hopped in front of the camera and picked up her chopsticks. I held my breath as she brought a large piece of kamaboko up to her lips. "Americano Kamaboko," she said before taking a bite. "Ah, oishi!" she said, which I knew meant "delicious!". And just like that, the camera was turned off, the days filming was done. My fate, as regards to any future filming, not to mention going to Japan, were in Mari-San's hands. It was she who would edit together the footage and make my appeal to the producers back in Japan. After hugs, thanks, and farewells, we were once again alone in the house. My cheeks were sore from smiling, my heart was still racing, and my hands trembled a little. I was thrilled that I wouldn't have to film any more, and couldn't even conceive of the notion that this all might lead to something even crazier. My sister summed up my state in this text to the family group chat. "Kipp is so tired, she just tried to stopper the bath with the tea pot lid by mistake!" 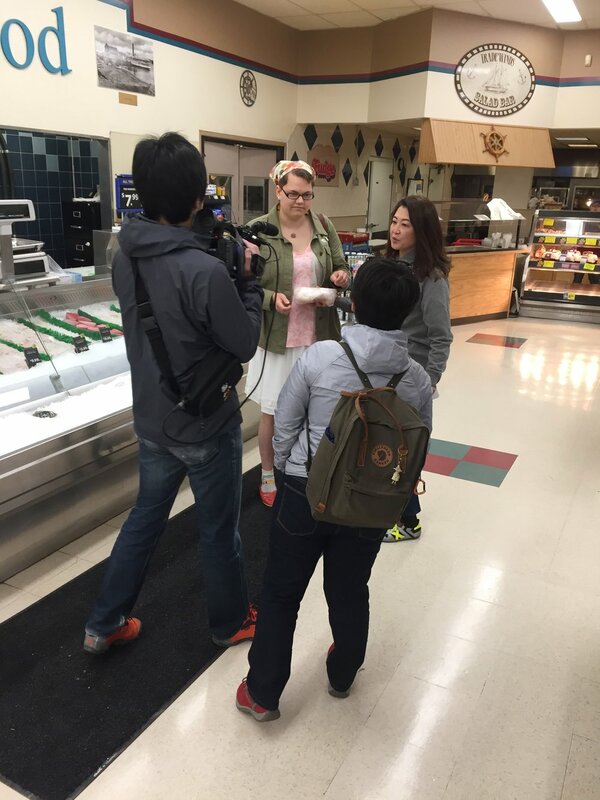 Of course, the next day I had to throw on the same clothes and meet them at the grocery store to film inside. It wasn't particularly eventful, or I guess I was just numbed at that point. We went into the store, I was stared at by the shoppers. I ordered the same fish from the seafood manager, who would later tell me that the whole experience made his day. While the camera man silently filmed a few filets of cod in the icy display, one of the deli attendants walked over. "What's happening over here?" she asked, a curious smile on her face. Akane-San explained, and the girl laughed. "Oh, I see," she said. "I was like 'wow, the cod is really popular today'!" It would be another few weeks before I would find out the results of my plight. I would love to tell you about how I was invited, but I promised Akane-San that I wouldn't give you the details, since it might ruin the surprise for other candidates. I would never want to spoil the joy that I too experienced, so I'll only say that a few weeks after filming, I was holding an invitation to Japan and would be setting out on my trip in only a month. The cat was obviously thrilled too. So, this is the end of the first section of my adventure. The part that takes place in America. In the next post, I'll be in Japan! Or at least, I'll be traveling there. I can't wait to tell you about it, and to, in some small way, relive those most wonderful days. Until next time, look out for Kamaboko rainbows! Receive the monthly Newsletter and occasional updates! Sometimes I even have giveaways, you don't want to miss that. Never shall we reveal your private information to any evil masterminds or other third parties. Our word is our bond.